40 players - 8 rounds of 4 player match play, 1 game per round. I’m then planning on top 12 qualify for finals top 4 byes then 3 games per round. I think thats gets me 100% TGP but wanted to check. Each round of qualifying is 1 game, times 2 (the four player bonus) = 2 games. Qualifying: 8 rounds * 2 games = 16 games. Each round of playoffs is 3 games, times 2 (the four player bonus) = 6 games. Finals: 3 rounds * 6 games = 18 games. TGP gets to 100% at 25 games (4% per game), so you’ve got significantly more than you need. Something that might help in the future is this calculator. Ryan, thanks, and yes I looked at the TGP calculator but it doesn’t handle byes etc. but still over the 100% though! which is great. You can find the TGP for 12 players with top 4 byes here. How do you even read that chart? N = number of players . . . which for Neil would be 12. Verify the number of players with a first round bye is 4, which is “1br” on the chart. The “QF”, “SF” and “F” values are simply the number of players remaining in the Quarterfinals, Semifinals and Finals. Once that’s all confirmed, that’s the row you’ll be using to determine TGP (which is the Green section to the right). Neil stated 3 games per round (the guide also lays out 1,4 and 5 games per round). Total TGP for finals would be +15 meaningful games played. I use that chart all the time. So much so that I often don’t even have to look at! With the 4 byes, you effectively have 2.5 rounds x 3 x 2 = 15. So with this format, you could actually do only 5 rounds in the qualifying phase and still reach 100% TGP. I didn’t realize this. So you average the shortest path (with byes), and the longest path (without byes)? So you average the shortest path (with byes), and the longest path (without byes)? You actually average out every possible path. 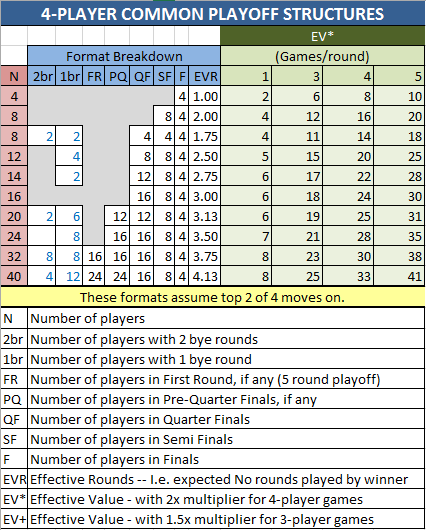 Of the top 8 finalists, 50% of them would have played 0 rounds up to that point (the players with byes), 50% of them would have played 1 round so far (the 5th-12th seeds of which 4 will advance). That equates to 0.5 rounds up to this point in finals of expected value. From there it’s a 100% chance that the winner plays 2 additional rounds. Total expected rounds played for the winner would be 2.5 rounds. 3 games per round is 7.5 games. 2X bonus in 4-player groups is 15 games. Why is this math being done from the perspective of the top 8 only? It should be noted that this no longer works for knockout tournaments. You need to go to the IFPA site instead for those. Thanks, it would be great if it could be updated, I found that tool to be fantastic when setting up my own tournament. that template is really helpful. I’ll happily set up a redirect if anyone wants to update the calculator and host it on their own. With my other projects (and annual WPPR changes) I don’t have time to keep it up to date. Any way you slice it you get the same answer.